The 2020 Ford Mustang Shelby GT500 has been unveiled and the American performance machine takes the GT350 concept to the next level. Powering the GT500 is a supercharged 5.2-liter hand built V8. Official performance figures have not yet fully been released, but we do know that the ‘Stang will have over 700 horsepower on tap. All of this works together with the aerodynamic shape and large rear wing to offer great track performance. As this is a muscle car 1/4 mile times and 0-60 mph times are huge. The Ford Mustang first appeared in the 1964 model year as a 1964.5. The pony car started a feud that would see Chevrolet answer with the Camaro. Of the ‘Stang Carroll Shelby famously said that it was a nice secretary’s car. 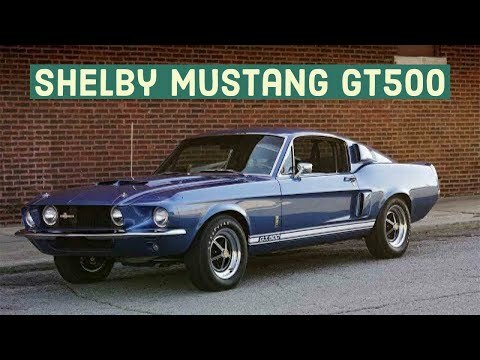 Mr. Shelby would then transform it to a much more power beast with the GT350 and GT500 models. The first generation of the car was very good as the horsepower wars raged and then it all fell apart with the Mustang II. Hot August Nights is going on right now in Reno, Nevada. The yearly get together of classic cars and hot rods is one of the biggest automotive events of the year. This year Barrett-Jackson will have their first ever auction at the event and they have something very special planned. The auction company is known for having great cars and also for their charitable auctions. This year Ford Motor Company will be selling the last 2014 Shelby GT500 Convertible at the event. The proceeds from the sale will go to the (BIAA). The BIAA is a charity that is close to the heart of Indy 500 winner Parnelli Jones and he will be in attendance for the auction. Such charitable auctions have in the past led to a lot of donation money from the sale of the cars. Often people will buy the car and then donate it back to the auction to sell again with proceeds once again going to the charity. Once someone does buy the car they will not only help a worthy cause, but they will also get a fire breathing sports car. The 2014 Shelby GT500 puts out 662 horsepower and can go from 0 to 60 mph in just 4.0 seconds . It also has very good handling especially when you consider that this Ford still has a live rear axle (something that is rumored to change in the next version). Beyond being auctioned off, Ford will also have the car in the Cruise-in on Friday, August 9th. TV coverage will begin on August 8th on SPEED with coverage on SPEED the entire auction with additional coverage on Saturday, August 9th, on Fuel TV. Ford Motor Company is returning to Hot August Nights – running August 2-11, 2013 – and is making its mark in a big way. In the charitable spirit of the event, Ford is selling the last retail 2014MY Shelby GT500 Convertible in Reno, where it will be sold at no reserve during the inaugural Hot August Nights Auction Presented by Barrett-Jackson. Proceeds from the sale will benefit the Brain Injury Association of America (BIAA), an organization championed by Indy 500 winner, Parnelli Jones, who will attend the auction. The winning bidder of this special vehicle can choose any interior, exterior and stripe color combination offered by Ford on the 2014 Shelby, making this a one-off factory custom car. Additionally, Jones will sign the Shelby in appreciation for the BIAA donation. Jones was introduced to the BIAA when his son, Page Jones, a rising racing star, suffered a severe brain injury during a Sprint Car race. His prognosis was grim, yet with the support of his family, he recreated a fulfilling, productive and joyous life. With the upcoming documentary entitled, GODSPEED: The Story of Page Jones, both the family and BIAA hope to raise awareness of the importance of rehabilitation for those who suffer from traumatic brain injury (TBI). At Hot August Nights, Ford is also pleased to celebrate America’s love affair with cars and rock and roll. During the festivities, Ford will be offering both Ride-and-Drive and hot laps experiences at the parking lot of the Atlantis Casino Resort. The Ride-and-Drive will feature Ford’s elite stable of vehicles – including the Explorer, Focus and Mustang – and Ford fans will be able to test their mettle running hot laps in such vehicles as a Shelby GT500, Focus ST and Fiesta ST. Also, while supplies last, Ford is giving Ride-and-Drive participants day passes to the Hot August Nights Auction Presented by Barrett-Jackson. Finally, Ford will be showcasing their vehicles in the Friday, August 9, Reno to Sparks cruise-in.